With this installment of EAR CANDY, we are branching into other forms of music. 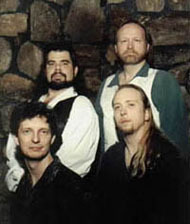 Let me present, EMERALD ROSE, a band which is hard to catagorize, whether you call it folk, celtic or new-age. From word-of-mouth talk about their energetic live performances, they have built a huge grassroots following. I talked to the guys about their many influences, music philosophies and their upcoming album! E.C. : Give me a little background on Emerald Rose, the members of the group and how they came together? Larry: Our men's work and play group, the Starbridge Hunt Club, Really brought us all together, though not initially for music. Working with magick and the land brought us together and established our friendship. Later, we discovered the mutual love of music and our respective talents assongwriters and performers. Arthur: I would also like to add the we found ourselves playing different instruments than we thought we would. We thought that Brian would be on whistle and Larry would be playing the bodrain. It was only after we really started playing together that the line-up fell into the shape we now find. Of course, now with the addition of new instruments, who knows where we will go next. E.C. : Who came up with the name Emerald Rose and what was the meaning behind it? Brian: I came up with the name as a means to unite several ideas about where the band was going. The Emerald symbol obviously refers to Ireland and the Celtic traditions, but it also refers to the "heart chakra." The Rose is a mystical symbol in numerous esoteric traditions, and is also a symbol of the heart. E.C. : How do you classify your music? Traditional Celtic, folk, pagan or all the above? Clyde: I'd say "none of the above." I'd say what we are trying to do as a band is to merge several different genres of music, in a sense "weaving a web." We draw from many different inspirations rooted in our heritage as well as our personal life philosophies and histories. Brian: A number of different groups have influenced our style: the bands of the Celtic folk revival of the last 15 years have had an unmistakable influence, but I think we developed our musical sensibilities from the bands we loved in our youth. Silly Wizard and the Tannahill Weavers were big influences of mine, but I'll also admit to a definite affinity for '70s and early '80s music such as Jethro Tull, early Queen, the Moody Blues, and Emerson, Lake and Palmer. Arthur was influenced a great deal by the California pop music scene and artists such as Jackson Browne and the Eagles. Arthur: If you had to categorize us, I think that you'd have to say something like, "Celtic folk pagan pop fusion." I think that Steeleye Span does a similar kind of fusion. E.C. : I think you've got a good thing going mixing your originals with the traditional tunes. It works great on the album, your originals complement the traditional tunes and vice versa. Was there a conscious effort to balance these? Brian: I would say, absolutely. We tend to write in certain styles, and we write for the instruments we play in the band. We tend to spice up the traditional music and do acoustic folk rock (influenced by Celtic music) as originals. I think the themes of the songs have a lot to do with that as well. We gave a good deal of thought to the placement of songs on the album to create a good flow. "My PBJ" is a very different song than "Dagger of the Moon!" But due to their placement, they both work on the album. Arthur: I find writing songs in a traditional style to be wonderful. I also like taking a traditional song and giving it a little twist. A lot of the originals on the new CD sound very traditional and some of the Traditional tunes sound like stuff on the radio. E.C. : Is the grassroots method of selling your CD's at your gigs the most effective? Has the CD paid for itself? Brian: The album has done very well for itself, paying for its studio and production costs and a bit more thus far. Our sales are split almost 50/50 between Web merchants (principally Amazon.com) and sales at gigs. Also, Circle Sanctuary has sold a number of our CD's. Clyde: However, the grassroots response to our style of music has been overwhelming at times. It seems that many people buy our CD's because of friends' recommendations. E.C. : What are your opinions on mp3's? I wholeheartedly support Napster and the mp3 revolution. It seems an excellent way to find out about new bands, enticing them to buy the whole album. The only ones who don't seem to like them are the corporate money-makers, who don't understand the promotional value. Brian: I'll give you an example of the way it works. In 1985, a friend gave me a bootleg copy of Silly Wizards's "Kiss the Tears Away". Today, I own over a dozen Silly Wizard/Andy Stewart albums and literally hundreds of people know about their music that wouldn't, if not for that one bootleg. Do you want to make money off your music, or do you want people to know your music? And can there be a synergy between those two? Larry: I'm wholeheartedly in support of the direct propagation of music without physical media, it's a great step forward for our culture. Now, we enter an age where the artist must become a Web entertainer, and attract attention in a whole new media. Clyde: I keep thinking about the Grateful Dead. Their music appealed to a tremendous cross-section of people, and the true foundation of their popularity was bootlegging, encouraged by the band itself. The music and the meme spread, independently of the production companies. If we want our music to spread and be heard around the world, we have to "cast our bread upon the waters." It's been proven time and again that it comes back a thousandfold. E.C. : When will the new CD be out? Hopefully the sound quality issue will be resolved on the second album. I understand there was a time deadline and that is one of the reasons the first CD lacked that trademark Emerald Rose percussion? Larry: Many of the sound quality issues were simply lack of time, others were instrumentation and vocal training problems. We've come a long way since then! While none of us have quit our "day jobs" yet, we have enough income from gigs and CD sales to spend an adequate amount on studio time. We're putting in four or more studio hours per song for this next CD, our vocal harmonies and accuracy have improved tremendously, and we expect to be very proud of the upcoming release. You'll hear a bit more percussion, and a lot more vocals. Expect a release in early July. Arthur: It was not only time that we short of, but money as well. After two years of "gigging" we have the funds to spend TIME in the studio. We only had enough money for 12 hours of studio time on the first CD. Normally, that would mean you could record three songs; we put down thirteen. E.C. : The originals on the first album were mostly Arthur Hinds's. Will the other members have more originals on the new album? I understand Larry Morris has blossomed into quite a comedic/storytelling songwriter? The only member that does not contribute original songs is Clyde. Does he write? Larry: Not only are we spreading out the initial songwriting sources, but we're working on more collaborative efforts. These days, none of us brings a song to the table without expecting it to go through critique, evolution, and significant change before it becomes a real "Emerald Rose" song. Sometimes it's difficult to remember who brought in the original lyrics! Clyde: My contribution to these songs has so far been more in the "back end" of evolving the music and fleshing out arrangements. Larry: He's bound to write Goth songs, though. We just know it. Brian: This winter, we took time away from rehearsal and performance just to write songs. We consciously began to write songs together. "Hills Of America" from the new CD is our first example. Arthur: I have written songs most of my life and have never composed with anyone else before. There are two songs on the new CD that opened that door to collaborative synergy. I hope that there will be many more joint works. E.C. : Has Emerald Rose received much radio play? I know that your genre pretty much limits airplay to public radio. Brian: Radio airplay wasn't one of the goals of the first CD. However, much to our surprise, we have received more airplay than we could have imagined! We have been featured on John Falstaff's award-winning "The Celtic Show" and have been played on public radio in Georgia, Illinois, and Arkansas. The real surprise was how much "Internet radio" airplay we got. SupaNova radio in England is playing the CD, Murphy's Magic Mess, Live365 and numerous MP3.com radio stations are also playing the music. We have had requests for the CD from radio stations in Australia, the Netherlands, Ireland and England. E.C. : The live arena seems to be where Emerald Rose excels. Have you thought of doing a live album? That way, you get the immediacy of the performance without losing the freshness that sometimes comes with too many overdubs. Brian: I believe we're still looking to capture that definitive sound in the studio. This is really our first chance to do it "correctly." We've played around with the idea of putting live cuts on the Website as "treats" for anyone surfing our site. Clyde: Much of the synergy we generate is an interpersonal relationship between the band and the audience. A live album would go far to convey the atmosphere of a "shared good time" that we strive for in our performances. Larry: I'd like to do a live Webcast! I think concerts and "gigs" are the heart-blood of this style of music, the more live, the better. Arthur: I think that a live album would be a blast and there may some songs that will simply have to wait on that CD to be recorded. E.C. : How many live performances does Emerald Rose do per year? Is it about time to get that tour van yet? Brian: About 50 to 60 per year, looking at last year as an example. But we're booking two months in advance now. We look forward to playing larger arenas and music festivals. Right now our goal is to promote the new CD, so we'll be playing out as much as possible. We have become very popular regionally as a "wedding and party band" as well as gigging regularly at McColgan's Irish Public House in Alpharetta and Fa Do's in Buckhead. Neither venue is really able to accomodate the size crowds we can draw, though they do serve great beer! Clyde: We've all purchased "multi-purpose cargo vehicles" already! So our next step up is the "tour bus" with Webcam! E.C. : Finally, what is your goal for Emerald Rose? Brian: We have different goals for different levels. The immediate goal is to make the best CD we can and to promote it the best way possible. In the future, we hope the music will reach a worldwide market. The '60s proved that music can be a very powerful tool for social change. I would like to increase awareness about diversity of magickal people and philosophies in existence today. If we can be successful in helping people understand their connection to the land and their ancestors, we will have accomplished quite a bit. Eventually, we would like the band to be "cornerstone" for a production company that produces new artists.